Dr Sun Yat-sen, Yau Lit, Chan Siu-pak and Yeung Hok-ling were called the “Four Great Outlaws”. The artwork, about 5 meters in height, showcases the aspiration of the “Four Great Outlaws” in artistic form. Putting words into action, a new country emerged. 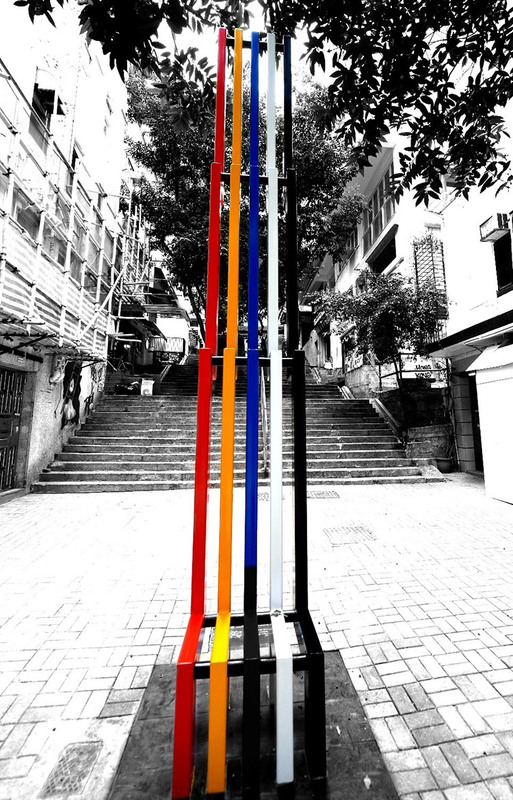 Kacey Wong’s experimental art project investigates the relationship between men, their social and political environment, and living space. He uses diverse methodologies including sculpture, installation, photography, performance, and social interventions. He was the winner of Best Artist Award in 2010, Rising Artist Award and Outstanding Arts Education Award given by the Hong Kong Arts Development Council in 2003. Kacey started his “Drift City” photo series since year 2000, dressing up like a skyscraper travelling from cities to cities in search for utopia and published the photo book “Drift City 10 Years” (2010). Hong Kong Public Museums and private collectors have collected his mobile home tricycle project “Wandering Home”, “Drift City” photo series and also “Sleepwalker”. His floating house “Paddling Home”, sailed once on Victoria Harbour, was the star feature in 2010’s Hong Kong & Shenzhen Bi-City Biennale of Urbanism \ Architecture exhibition.